The 7th Annual Veteran’s Appreciation and Resource Picnic will be held Saturday, August 27, at Rusch Park, 7801 Auburn Blvd. 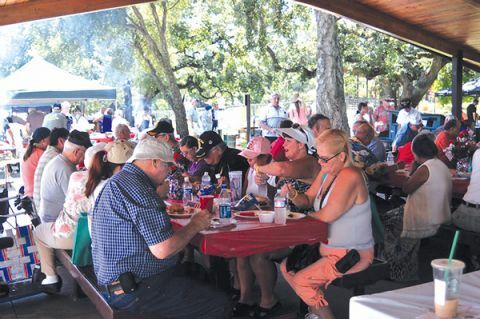 at the Gazebo/Pavilion from 10 a.m. to 3 p.m.
Citrus Heights American Legion Post 637 is hosting the 7th annual Veteran’s Appreciation and Resource Picnic to honor the area’s active duty servicemen and servicewomen, our retired veterans of past wars and conflicts, and their families. This free event will be held Saturday, August 27, at Rusch Park, 7801 Auburn Blvd. at the Gazebo/Pavilion from 10 a.m. to 3 p.m. All veterans and their families and friends are welcome. The day will begin with the award winning Bella Vista High School Marching Band, the Folsom Marine Corps Honor Guard, and recognition of our veterans from members of city council and local veteran’s groups. Guest of honor this year is Alejandro Jauregui of Williams, CA. Jauregui served two tours of duty in Iran and was on his second tour in Afghanistan in 2012 when he stepped on an IED, resulting in the loss of both legs. A traditional “Missing Man Table” memorial is being created to honor those fallen soldiers who cannot be present. Be sure to look for the horses and canines, a favorite of adults and children alike. Horses Healing Heroes and 4 Paws 2 Freedom will be present, sharing how their programs help our veterans, along with dozens of other veteran and non-profit resources. Scheduled children’s activities include a bounce house, face painting and crafts. Lunch will be a hot dog and hamburger barbeque with all the fixings prepared again by Wild Wade’s BBQ & Grill of Citrus Heights. Members of the American Legion Auxiliary Unit 637, GFWC Citrus Heights Women’s Club and the Lion’s club will provide dessert and drinks. Covered, accessible picnic tables are available or bring your own chairs, blankets and umbrellas. Our sponsors and members of the community are donating gift baskets and other opportunity drawing prizes to show their appreciation to our veterans.